The Variant Manager is a central tool that allows you to manage various variation points that are modeled using variant blocks in a system model. A model hierarchy may contain several variant blocks, each with many variant choices, combinations of which correspond to particular configurations of the system. Switching between variant choices and validating them manually can be complicated and erroneous. 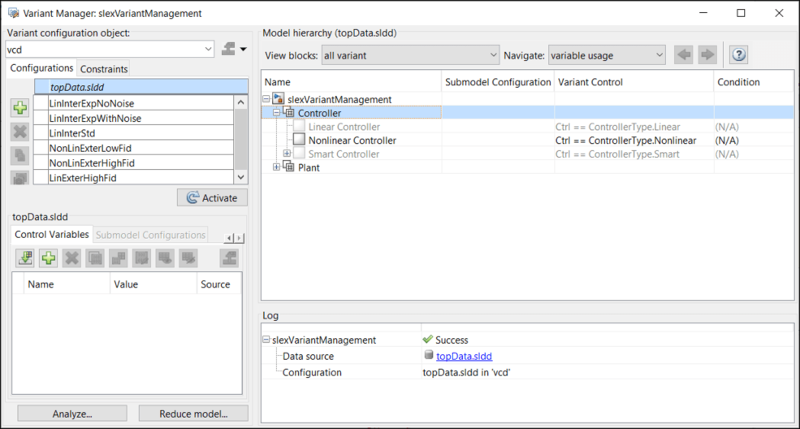 Use the Variant Manager to create predefined configurations for a model, and use the model under any of the configurations. You can create the configurations by combinations of different variant choices across the model hierarchy. Define, validate, and visualize variant configurations. 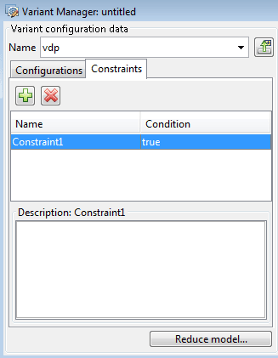 Define and validate constraints for the model. Specify the default active configuration. Set control variables to either integer, enumeration values, or Simulink.Parameter objects. Associate Simulink.VariantConfigurationData object with the model. Validate a variant configuration or model without updating the model. Reduce a model to retain subset of variant configurations. 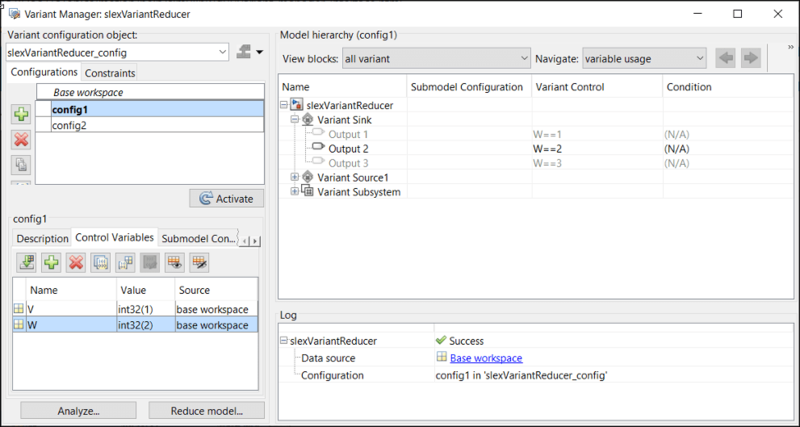 For information on analyzing variant configurations from Variant Manager, see Analyze Variant Configurations in Models Containing Variant Blocks. For information on analyzing variant configurations from command line, see Simulink.VariantConfigurationAnalysis. Right-click the variant badge and select Open in Variant Manager. Right-click the variant block, and in the context menu, click Variant > Open in Variant Manager. 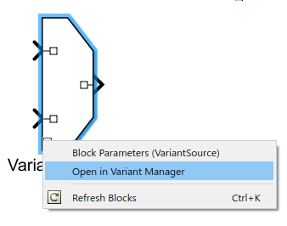 Select the variant block, and click Diagram > Variant > Open in Variant Manager. Click Open block in Variant Manager available on the variant block’s Block Parameter dialog box. The Variant Configuration Data pane which enables you to define variant configurations and constraints, and export them in variant configuration data object. The Model Hierarchy pane which enables you to visualize the variant hierarchy. The Log pane which displays information on the source of control variables and validation errors. Use this pane to create configurations, define control variables, associate referenced model configurations, and define constraints. The configurations and associated data are stored in a variant configuration data object. After you add a variant configuration, type a name for the variant configuration object in the Variant configuration object box. You can use the drop-down menu to load a variant configuration object from a file or refresh a loaded variant configuration object. You can load a variant configuration object either from a MAT file or a MATLAB script (.m file). To store the variant configuration object in the model, global workspace and associate it with the model, click Export . To store the variant configuration object in a folder of your choice either as a MAT-file or a MATLAB script (.m file), click Save As from the drop-down menu of the Export button. The Configurations tab is divided into upper and the lower panes. You can use the upper pane to add, delete, or copy a variant configuration. You can also set a default configuration. When you set a configuration to be default configuration, validating or updating the model activates the variant choice specified in the default configuration. The upper pane has these buttons to manage a variant configuration. Description — Provide a description for the selected variant configuration. Control Variables — Add, delete, copy or import control variables. Toggle data type and import control variables from the workspace. A control variable can be either a plain MATLAB variable or a Simulink.Parameter object. Edit Simulink.Parameter control variables. This option gets activated when the selected control variable is a Simulink.Parameter object. To specify Simulink.Parameter control variable as an expression, set the Value property of the parameter object by using an equals sign (=) followed by a mathematical expression. For example, enter = A + B. Control variables from blocks in Label mode are not imported, as they are not variant control variables. 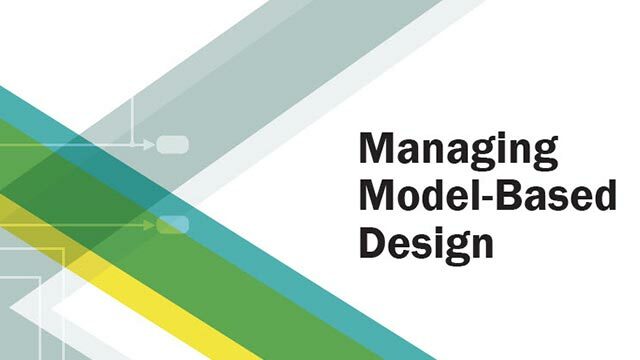 Submodel Configurations — Define variant configuration for a referenced model. Add or delete a referenced model configuration. To refresh and activate the variant model for a configuration, select a configuration from the list of Configurations and click Activate. If you click the Activate button without selecting any configuration, the values for the Control Variables are picked from the global workspace. For such cases, the Control Variables that are defined in the Variant Manager overrides the corresponding values in the global workspace unless a default configuration is set. If a default variant configuration is set, the corresponding control variables are applied. When you open the Variant Manager for a parent model that contains referenced models (submodels), only the parent model is validated. The referenced models (submodels) are validated only when you activate or expand (click +) the reference models. Use the Constraints tab to add or delete the model-level constraints. Similar to the Configurations tab, the Constraints tab also contains upper and lower panes. The upper pane displays the name and condition of the constraints while the lower pane displays the description. The condition expression of the constraint must be satisfied by all variant configurations in the model. You can visualize and explore the variant hierarchy of a model and edit the properties of variant blocks, variant choices, and variant objects from the Model hierarchy pane. This pane displays the Name, Submodel Configuration, Variant Control, and associated Conditions of variant objects used as variant controls. Navigate among variable usage, active choices, invalid choices, and overridden variant choices. Select Variant blocks to display all variant blocks. Select Label mode variant blocks to display variant blocks in Label mode and other Model blocks. Variant blocks in Expression mode, which contains blocks in Label mode within their hierarchy are also displayed. Select Expression mode variant blocks to display variant blocks in Expression mode and other Model blocks. Variant blocks in Label mode, which contains blocks in Expression mode within their hierarchy are also displayed. Select All hierarchical blocks to display all hierarchical blocks (for example, Subsystems, Model blocks) in the model. Variable usage— selects the previous/next rows in the model where the selected control variable is used. Active choices— selects the previous/next rows in the model having active variant choices. Invalid choices— selects the previous/next rows in the model having invalid variant choices. The model hierarchy is displayed in a tree, with each block representing a node in the hierarchy. The hierarchy displays active, inactive, overridden, and invalid variants. You can edit referenced model configurations, variant controls, and variant conditions. Expand nodes to view the underlying blocks. Protected reference models cannot be viewed in the hierarchy. Name — Name of the model or block. 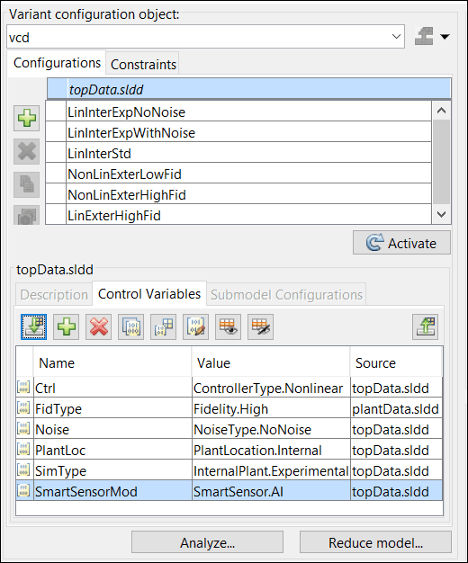 Submodel Configuration — Configurations used by referenced models. You can only edit the Submodel Configuration for rows that display models referenced by the top model. Variant Control — Variant control parameter of a variant choice. This column is identical to the Variant Control column of the parameter dialog box of variant blocks. You can edit this column for variant choices across the hierarchy. Condition — Displays and allows you to edit the condition for the Simulink.Variant object when it is used as variant control. You can edit this column for variant choices across the variant hierarchy. Open and Highlight Block: Highlights the selected block in the model while displaying selected block location from the top model. Open Model: Opens the selected model while displaying selected model location from the top-model. This option is available only when you select a model from the hierarchy table. Open Block Parameters: Opens the block parameter dialog box for the selected block. You can choose to modify the parameter values. Open Parent Block Parameters: Opens the block parameter dialog box for the parent block of the selected block. You can choose to modify the parameter values. Set as Label Mode Active Choice: Sets the selected choice of Variant Subsystem, or Variant Sink, or Variant Source blocks as active choice. This option is available only for the Variant Subsystem, or Variant Sink, or Variant Source blocks in label mode. In the model hierarchy section, each block is represented with an icon. The following table displays the icons and the corresponding block name. Variant Subsystem block with Propagate conditions outside of variant subsystem option selected. Variant Subsystem block with Analyze all choices during update diagram and generate preprocessor conditionals option selected. Variant Subsystem block with Label selected as Variant control mode and an active variant choice is selected from the Label mode active choice option. Variant Subsystem block with Propagate conditions outside of variant subsystem and Analyze all choices during update diagram and generate preprocessor conditionals options selected. Variant Subsystem block with Propagate conditions outside of variant subsystem option selected. Also, Label selected as Variant control mode and an active variant choice is selected from the Label mode active choice option. Inline Variants Block (Variant Source and Variant Sink) with Allow zero active variant control option selected. Inline Variants Block (Variant Source and Variant Sink) with Label selected as Variant control mode and an active variant choice is selected from the Label mode active choice option. Inline Variants Block (Variant Source and Variant Sink) with Analyze all choices during update diagram and generate preprocessor conditionals option selected. Inline Variants Block (Variant Source and Variant Sink) with Allow zero active variant control and Analyze all choices during update diagram and generate preprocessor conditionals options selected. The Log pane displays information and validation results of the source of control variables for the models in the hierarchy. For example, if a variant configuration is used for a referenced model, the referenced model name is displayed in the row along with name of the variant configuration data object and variant configuration. The pane also displays errors encountered during validation of the variant configuration.